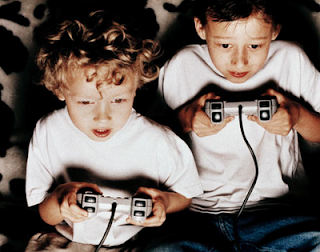 Guitar Blog: The average 21 yo American has spent 10,000 hours on video games. Why not guitar? The average 21 yo American has spent 10,000 hours on video games. Why not guitar? This is an intriguing question. Almost every 21yo I speak to would love to be able to play guitar but few find any real satisfaction in their mastery of video games. In fact they usually won't even admit their gaming obsession. There are no real long term benefits to playing video games and in fact the opposite is true. Research has shown that too much video gaming can lead to depression and anxiety. See the article 'Reduce kids video game time...' If they were to use the 10,000 hours studying or practicing any one of a thousand or more other skills they would find themselves in the top 1%. Whether it be sports, academics or music. Studies done on violinists found the best had done around 10,000 hours of practice. "Come and watch me play my video game"
If you are going to invest 10,000 hours to master something why not something that offers real rewards. Being a video game master is not something that I would imagine holds the same rewards as guitar. The feeling you get from just 500 hundred hours of guitar practice let alone 10,000 hours is not only truly satisfying but your friends will take pleasure in hearing you perform. Start playing your video game for them and I doubt you will get much interest no matter how good you are. Why do people invest so much valuable time in to video games? I recently read that the richest person in Japan now is not a car manufacturer or a phone company or even a banker but the owner of Nintendo. Games are big business. The prime difference between a game and say learning guitar from what I understand is the game is akin to gambling. Gambling is seductive because as studies show small payouts keep you interested and often lead to addiction. They can predict with surprising accuracy at what point the average person will lose interest. In gambling this is important because they want your money but if they get too greedy you will walk away. With video games they are developed in such a way that you receive enough small rewards to keep you in the game and gradually you become addicted. With games they want to keep you feeling challenged. Make it too easy and you get bored. Too hard and you won't bother trying. Guitar as with many worthwhile skills falls into the 'too hard' basket. Guitar just doesn't have the addictive qualities required to pull you in like video games and gambling because it lacks the small rewards. There are small rewards of course but most are infrequent and only begin to appear when you commit to regular practice. Sit at a video game for 10 minutes and it is likely you have already won several times and move to the next level. You get a feeling of real accomplishment. The little voice in your head says 'Hey you are good at this'. 10 minutes of guitar and the result will likely be sore fingers and perhaps a few notes of a riff but with the little voice saying 'This is no fun. Let's do something else'. What makes guitar even more challenging is at times it can take weeks, months or even years to develop some of the skills required to play your favorite songs. The payouts are illusive and at times seem impossible to achieve. This is why after 10 minutes of guitar practice you are more likely to lose interest opposed to 10 minutes of video games but ask yourself the following question. Which option offers the greatest pleasure long term? If in doubt about the answer ask any long term guitarist. Jane McGonigal's TEDTALK presentation helps to understand why games are seductive.